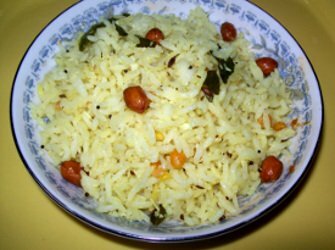 Mavinkai chitranna, green mango rice recipe is a special rice recipe from the Southern State of Karnataka. It is a main item of the menu on 'Ugadi", the new year day feast, which falls in march or April every year. 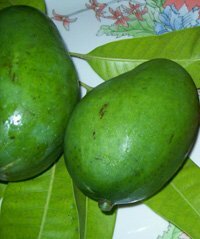 It is called Mavinkai chitranna as 'mavinkai = raw green mango', 'Chitranna = colorful rice' in Kannada language. This Mavinkai Chitranna is made specially in the beginning of the summer when the raw green sour mangoes are available in plenty. Along with Kairi pana or Mavinkai panka, mavinkai chitranna is on the menu to celebrate the new year. This can be made in advance as it doesn't need to be served hot. It is served at room temperature. Take it for picnic or for lunch to work. Peel a green mango and grate it with a fine grater. Check the sourness of the grated mango and if it is too sour, reduce the quantity of grated mango you will use for the recipe. Heat oil in a pan. When it is hot, add mustard seeds, cumin seeds. Let them splutter. Add the dry red chilies and green chilies. Add peanuts and fry for a 15-20 seconds or till you get the roasted peanut flavor. Do not let the peanuts overcook. Add chana dal and urad dal. Add curry leaves. Add the grated green mango and coconut. Spread the cooked rice over mango mix. add salt. Mix the rice well with the mango mixture. 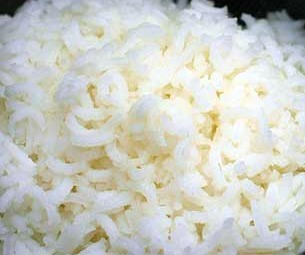 Do not cook the rice till it is too soft and mushy. Each grain should be separate.